Give flight to your fancy for nature's winged creatures. 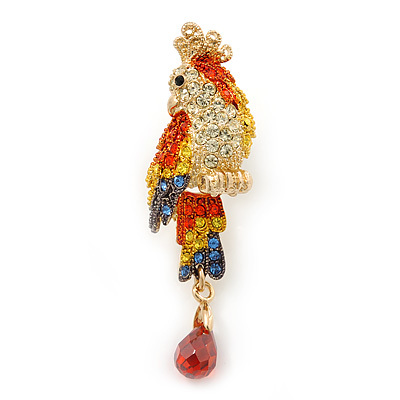 Featuring an exotic parrot design, crafted in gold plated metal and pave set with multicoloured Swarovski crystals. The tail decorated with a faceted, teardrop shape glass bead in hues of red. The pin measures about 5cm x 1.5cm and secures with a flag pin and revolver fastening. Pin this gorgeous brooch to accent your lapels, scarves, hats, handbags and more!